#8sunday July 05 , 2015 Poem: Are you me? It’s Weekend Writing Warriors time again. This would have been my submission, I offer another poem. Like a fox and his reflection. Magically bound by forces unseen. Like a reflection and his fox. So which am I now? 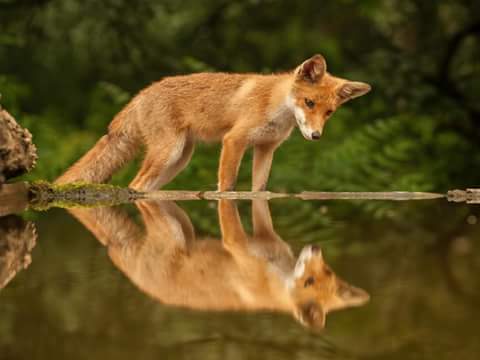 The fox or his reflection. If you enjoyed reading this, please, let me know. Your comments or impressions are very welcome. Alternatively, click on the ‘like’ button below. To see what the other Weekend Writing Warriors have submitted, click on the link below. Self-reflection often leaves us feeling as if we are just watching ourselves on some other plain, sometimes it doesn’t even feel real. You’ve expressed your inner turmoil very well and in a way that makes the reader think. Very good poem. Thank you Chelle. I agree. Often we get stuck in the ‘disassociation’ and then the wheels fall off! Reminds of that face in the mirror poem. The theme there is that we may not like that reflection and therein comes motivation to improve ourselves. I suppose it’s all a metaphor for taking that self inventory now and then as suggested in 12 Steps for recovery addictions. It’s hard when we don’t recognize ourselves. I agree Cara. The same goes when we look at our loved ones and they are strangers. It can be very scary. I like the question posed in the poem. Family drama can certainly inform our writing. Sometimes writing about what separates us is the only way I can find my way back to myself. Very cool, Kim. Thanks for posting. Thank you Paula. I do think we lose ourselves in the drama and take on other people’s emotion. I like the phrase ‘ find my way back to myself’ a lot. It sums up the process beautifully. Wow-that’s very thought provoking. Nice eight. Beautifully written poem. I do hope your life calms a bit for you. Hugs. Kim, that is beautiful. I think you’ve expressed so well how we each have a stranger living inside of us. Thank you Teresa. I know it will get better. In fact it already is. Now I must just sit down and write. I’m sorry for your pain. July is apparently not just a tough month for me..
Holding you close in my thoughts. Thank you Shan. Yes, it has been emotionally torrid. I am learning to sit with it and not run off. (weeping) Thank you for sharing Shan. I have no words, just tears. Sending light to illuminate your memories. Excellent idea. Creates a lovely picture in my head.